I would keep it for myself…I love Oregon Trail! This would be for my grandson, he would love it. I would give this to my son and daughter. Thanks! I’d give it to my husband. Thanks! I’d keep it! I loved playing this when I was a kid! My whole family would play. 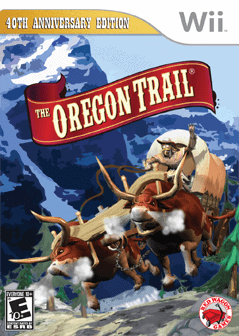 We love Oregon Trail. I would give it to my kids…but I would play it with them. I would definately keep this for our family. I bought a download of (what I think is this game) from a site years ago and played online. I was addicted. Of course I have no idea where the download number is now..so I would love to win this. I bet it would be fun playing on the Wii. This one would totally be for my husband!!! I would give it to my kids…not surewhich one would enjoy it themost though! the kids and I would like to play it also! I would give this to my son. He used to play this game years ago on the computer and loved it. My kid brother has a wii…I would give this to him…I think he would really enjoy it! I know I did. This would be for me! I loved playing this game in school and I think I’d still enjoy it! I would give this game to my kids if I won. It would be for my whole family. I would give this game to my friend.